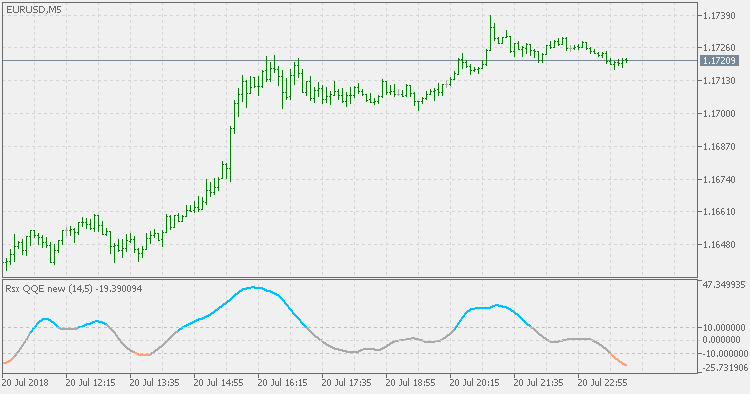 The QQE (Quantitative Qualitative Estimator) indicator consists of a smoothed Relative Strength Index (RSI) indicator and two volatility-based trailing levels (fast and slow). Compared to the original QQE indicator, this version instead of using trailing levels uses fixed levels to estimate overbought and oversold conditions. That makes it a bit easier to use. This version is also using RSX (a smoother RSI without a lag) in order to further purify the signals. Compared to the original QQE indicator this version is adding fixed levels (to help further estimate the trend) and color changing histogram (based on those levels), and also using RSX (a smoother RSI without a lag) in order to further purify the signals. This version of QQE is also using RSX (a smoother RSI without a lag) in order to further purify the signals. The Random Walk Index attempts to determine when the market is in a strong uptrend or downtrend by measuring price ranges over N and how it differs from what would be expected by a random walk (randomly going up or down). The greater the range suggests a stronger trend. The RWI states that the shortest distance between two points is a straight line and the further prices stray from a straight line, implies the market is choppy and random in nature. In order to avoid the too many signals that the regular Random Walk Index tends to produce, this version is using JMA for smoothing which significantly lessens the number of false signals.